Scores Dead In Haiti Cholera Outbreak : Shots - Health News Haiti hasn't had an outbreak of deadly cholera for decades, but conditions are ripe for one in the wake of January's earthquake. Officials fear it could spread because tens of thousands of people are still living in unsanitary conditions. 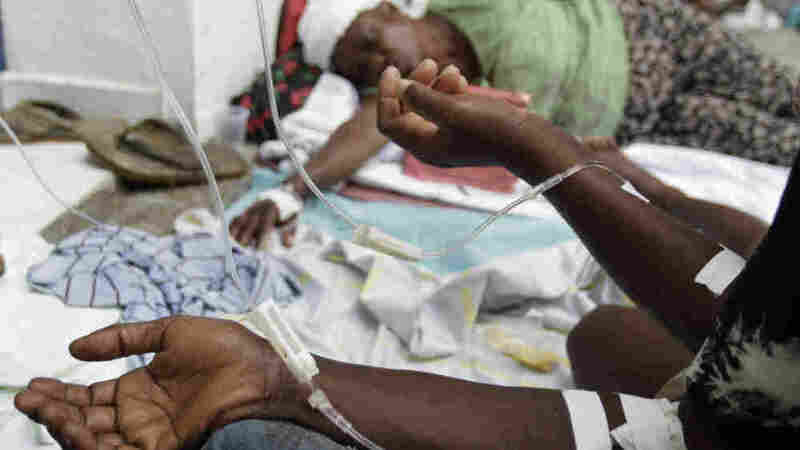 An outbreak of cholera has struck Haiti nine months after a devastating earthquake. More than 100 people have died and more than 1,000 have become sick. So far the outbreak has not reached the camps in Port-au-Prince that shelter hundreds of thousands of people who lost their homes in the earthquake. As NPR's Jon Hamilton reports, public health officials are working hard to keep the disease from spreading to the capital. JON HAMILTON: The outbreak began in an area about 60 or 70 miles north of Port-au-Prince. Dr. Michel Thieren is with the Pan American Health Organization in Haiti. He says hospitals near the outbreak have been overwhelmed with some setting up outdoor treatment areas. But Thieren says at this point it's hard to know how many people are sick. Dr. MICHEL THIEREN (Pan American Health Organization): What we know now is that it is an epidemic that is accompanied with a high mortality rate with about 10 percent (unintelligible) fatality rate. HAMILTON: Cholera kills by causing diarrhea and vomiting so severe that people become dangerously dehydrated. It is spread when food or water becomes contaminated with a bacteria that infects the intestines. Thieren says it's not clear why this outbreak occurred in a nation that hasn't seen cholera for decades. Dr. THIEREN: It is misleading to associate the earthquake with the appearance of the disease. That has nothing to do with one or another. HAMILTON: Thieren says now that cholera has appeared, the camps around Port-au-Prince are especially vulnerable. That's because people live in poverty and in close quarters often without adequate sanitation and sometimes without clean drinking water. Dr. THIEREN: The conditions are still the one of about a million, a million and a half of the straight population in precarious conditions. This is never good news for water-borne disease epidemics. HAMILTON: And Paul O'Brien from the organization Concern Worldwide says cholera could make its way to the capital quickly because so many people travel back and forth. Mr. PAUL O'BRIEN (Concern Worldwide): Usually the contamination is in feces of infected people, so it may not have started in the camps, but I suppose people are very worried that it could spread to the camps and therefore spread extremely quick within camps. HAMILTON: Even so, O'Brien says the relief agencies that have been working in Haiti since the earthquake hit are well prepared to contain the outbreak. Mr. O'BRIEN: This is not a situation completely out of control. So while I know the numbers may sound kind of quite large and the whole fear around cholera because it can spread so quickly and because it can kill so quickly, really is actually quite a simple method in terms of treating and preventing. HAMILTON: Treatment usually means drinking lots of water or fluid specifically designed to prevent dehydration. Very old patients may need to get fluids intravenously. Prevention involves providing clean drinking water and making sure people wash their hands and cook food thoroughly. And there's one other option: vaccines. Peter Hotez is president of the Sabin Vaccine Institute and head of the microbiology department at George Washington University. He says health officials are going to need to make a key decision in the next day or two. Dr. PETER HOTEZ (President, Sabin Vaccine Institute): Are they going to conduct either a nationwide vaccination campaign or a regional one, even though this disease is not occurring in Port-Au-Prince, because they're so decimated in Port-Au-Prince and vulnerable, do you want to go ahead and vaccinate them anyway? HAMILTON: Hotez says ideally vaccine should be administered before cholera is sweeping through an area because they take more than a week to provide protection. Hotez says whether or not officials decide to use vaccines, it should be possible to halt the outbreak. Dr. HOTEZ: The Pan American Health Organization is one of the best functioning health and sanitary organizations anywhere in the world and I'm confident they'll be able to handle this and contain it. HAMILTON: Because cholera can spread so quickly and kill so quickly, it should be clear within days whether their efforts are succeeding. The chief medical officer for Partners In Health, Dr. Joia Mukherjee, told reporters this afternoon she is concerned the cholera outbreak may continue to spread. As of this afternoon, her organization is reporting more than 2,000 cases of cholera and 160 deaths at Haitian health care facilities.